This issue of News and Reviews brings together three striking films that raise questions about identity, gender, and sexuality in a variety of Asian contexts. My Way follows two male actors in the Cantonese Opera as they try to pursue careers as Qian Dan, or males playing female lead roles. In I Am, a filmmaker returns to India, a country she had left twenty-one years earlier following her mother's death there, and through a reverie focused on old photographs explores how laws against homosexuality and restrictive social norms shaped her own life as well as those of a series of people who have come out in India. Tales of the Waria is a nuanced exploration of four waria, "men who live as women believing they were born with the souls, feelings, and instincts of a woman." All three films present complex realities, where individual lives play out in contexts that embrace both long-standing traditions and new ways of thinking about identity and the ways we define gender. Revealed are worlds where both tradition and new, often Western labels ("gay," "transgender," etc.) are revealed to be descriptors that do not do justice to the web of relationships, experiences, and desires that make up individuals. Directed by Cheung Cheuk. 2012. 72 minutes. In Chinese with English subtitles. 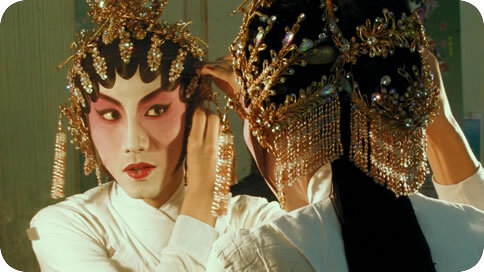 A male Dan, or Qian Dan, is a female character in Chinese opera portrayed by a cross-dressing man. The documentary My Way depicts the dreams of two Cantonese Opera actors, Hau-wei Wong and Wing-Lun Tam, and their desire to become male Dan. My Way follows them over seven years, from 2004 to 2010, as they encounter various difficulties on the road towards their dreams. This documentary makes people think, "Which way is it? Are Wong and Tam on the same path?" The male Dan is a tradition in Chinese opera, especially well-known in the Peking Opera. One of the most famous male Dan in modern history is Mei Lanfang (1894-1961), who was popular in the early 20th century, not only China but also in Europe, the United States, and in other parts of East Asia as well. Mei was famous for portraying female characters, "Dan," usually playing the female protagonist. Because Mei toured around the globe as a male Dan, his popularity left people with the impression that male Dan are a common practice in Chinese opera. However, the practice varies in regional theatres, and Cantonese Opera has no such tradition. In Cantonese Opera, male impersonators are often more popular than female impersonators but sometimes both the male and female leads are performed by women. One of the most famous couples in Cantonese Opera was Maestra Kim Fai Yam (1913-1989) and Maestra Sheut Sin Bak (born 1926), with whom Wong compares Tam and himself. It becomes an interesting comparison given that Tam and Wong comprise a couple played by men, whereas Yam and Bak are both women. The "way(s)" that Wong and Tam desire to take are, consequently, not conventional ways. Directed by Sonali Gulati. 2011. 70 minutes. In Hindi and English with English subtitles. After the passing of her mother, filmmaker Sonali Gulati leaves her girlfriend in the US to travel back to India, a country that only recently abandoned the law that criminalized homosexuality. She returns to empty out the home where she and her mom once lived together for twenty-one years. The title I Am is both unfinished and complete. Invisible ellipses stand in for Sonali's unspoken words, the missing object at the end. In the meantime, the title is a complete sentence, a matter-of-fact statement about identity, needing no modifiers. Directed by Kathy Huang. 2011. 56 minutes. In Indonesian with English subtitles. Tales of the Waria explores the stories of Indonesian nationals Suharni, Mami Ria, Tiara, and Firman, four waria, or men who live as women believing they were born with the souls, feelings, and instincts of a woman. According to the documentary, waria is derived from the words wanita (woman) and pria (man). Indonesia is home to the world's largest Muslim population, and director Kathy Huang says that her first inclination was to explore how the waria negotiated the role of Islam in their lives. But her interview subjects were not interested in that topic. Instead, they desired a film exposé that would explore how to find lasting love. Huang first discovered the waria via a news story in 2005 through the waria supermodel pageant, which opens the film. A few years later, a news story revealed that President Obama had spent some time as a child growing up in Jakarta, in the care of a waria, which prompted Kathy to want to learn more. After taking some Indonesian language classes and seeking the counsel of a well-known anthropologist known for his work with the queer community in Indonesia, she traveled to the town of Makassar, the primary setting for the film. AsiaLENS is a series of free public film screenings and lecture / discussion programs -- organized by AEMS in collaboration with the Spurlock Museum and Illinois Program for Research in the Humanities -- presenting recent documentary and independent films on issues reflecting contemporary life in Asia. Local and visiting experts introduce the films and lead audiences in post-screening discussions. Directed by Jang Hee-Sun. 2014. 94 minutes. In addition to hosting film screenings, AEMS also produces and distributes its own materials under the brand name Media Production Group (MPG). These are short educational videos and DVDs about an aspect of Asian culture suitable for classroom use and accompanied by curriculum. The AEMS library, through its connection to the Illinois Heartland library system, circulates videos and DVDs locally from its collection of more than 2,000. Search our online catalog here.